You can select tags from a drop-down menu. If your institution set up tags, they are displayed, starting with the name of the institution. 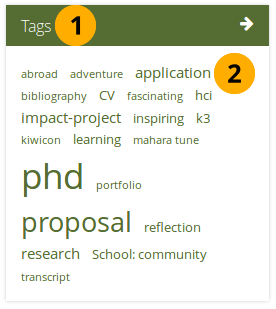 You can see your tag cloud in the sidebar when you are in the Pages and collections and Files areas. 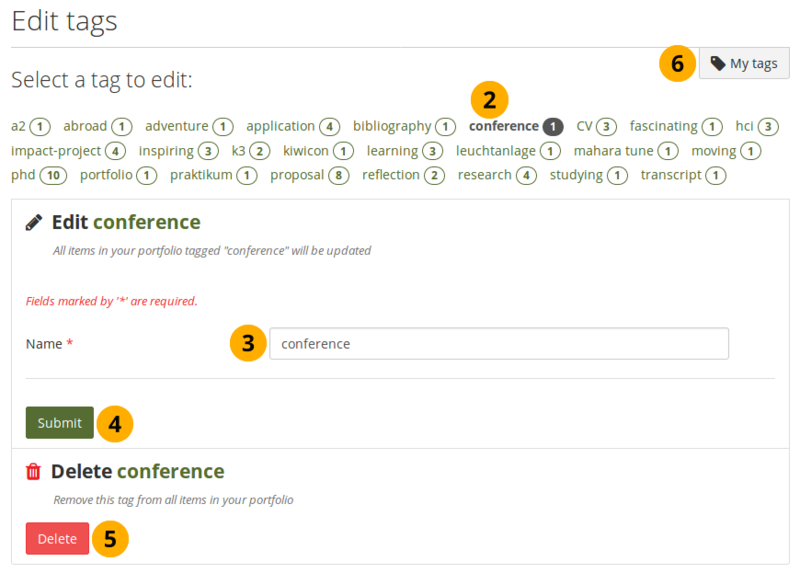 Configure how many different tags you wish to display in your tag cloud in your account settings. 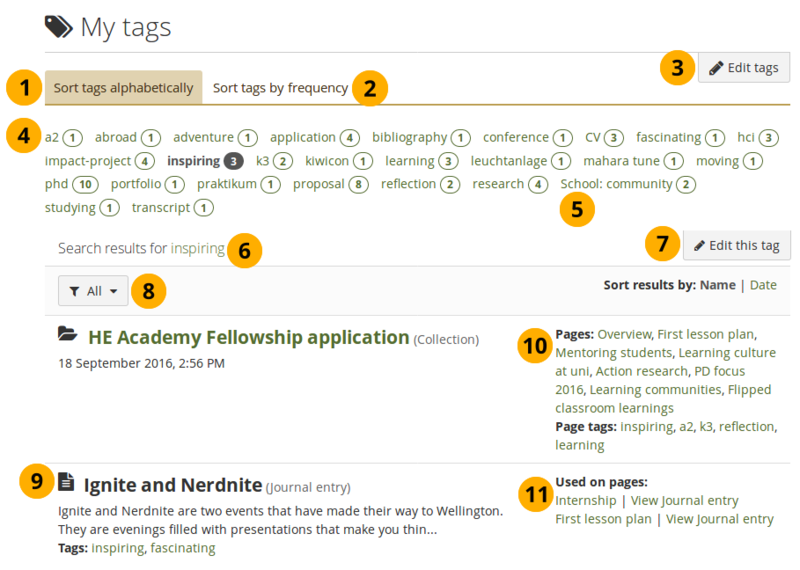 On the My tags page you see all your tags and the artefacts, blocks, pages, and collections associated with them. You have a number of filter options to show only the resources that you wish to see. Institution tags are listed as well with the institution name before the tag. Institution tags do not appear when you edit your tags as you cannot edit them. Journal entry: Shows only journal entries. Plan: Restricts the results to plans. 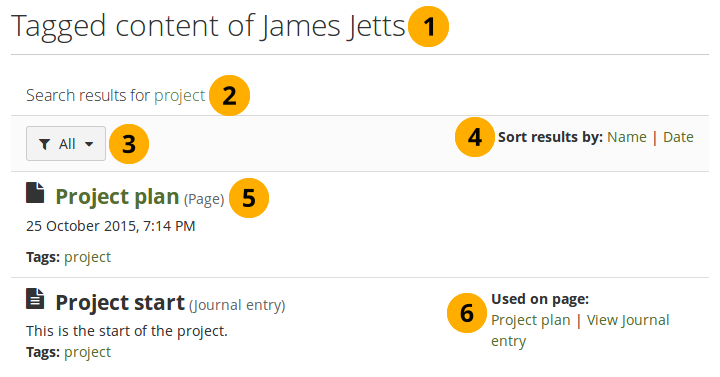 Plan task: Filters the results and only displays plan tasks. External: Only displays results from the “External media” block. Résumé: Shows only results from the résumé. The title of a resource, its description if available, creation date and time for pages and collections, the tags used, as well as the type of resource are displayed. If a collection is displayed, its pages are listed along with the tags used on those pages. If an artefact is displayed, the pages in which it has been used are displayed along with a direct link to the artefact. You can explore the content of another person’s portfolio by clicking a tag on their page. By doing so, you get to see a list of all artefacts, blocks, pages, and collections that have been tagged with this tag and to which you have access. You can only view tagged content of other people, but not group, institution, or site portfolios. Click a tag underneath the page heading or on any artefact that you can see on the page to be taken to the page where all tagged content is displayed that you can view based on your permissions. The page heading tells you that you are viewing the content of the portfolio owner. When the portfolio owner shared their portfolio publically or via a secret URL and a person who is not logged in views the page and follows a tag, they can only see content tagged on that particular portfolio but not anywhere else. You see the tag that you selected. You can filter according to content types. If the portfolio owner shared more than one portfolio with you in which the tag was used, you see that content as well. Sort: You can sort the results by name or date. You see the content item. If it is a page or collection you can click it directly. All tags are mentioned associated with that content item. If it is an artefact, you see the page title and have a direct link to the artefact. Blocks only point to pages as they do not have artefact details pages.